Happy Thanksgiving to my fellow Canadians! I've been busy with school and work lately so my anime watching/ writing has decreased substantially. From Summer 2015, I've only been able to catch up with Prison School but I want to watch a couple of more titles from that summer cycle however I rarely can find the time to watch and when I do have time to watch I'd rather go to sleep haha. Hopefully I can catch up with everyone during the Christmas break but for now I want to do a very quick review an anime I've watched this past summer which I fell in love with which was Hanasaku Iroha. As a fan of slice of life, this genre can be a daunting for a lot of people, mainly because there tends to be no plot with actual substance and the locations where there slice of life anime take place are either at school or somewhere basic lol. Anime that come to mind when I think about this include: Working, Aria, Kimi to Boku and many others- though these anime take place in dull settings, they were actually phenomenal pieces of work. 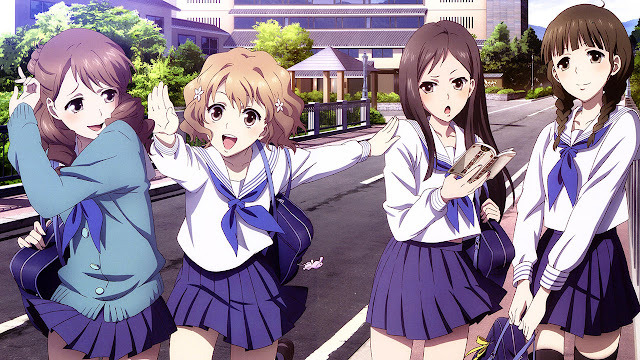 I can happily add Hanasaku Iroha as part of that great circle of slice of life anime. Hanasaku Iroha follows a bright and driven girl by the name of Ohana Matsume as she is sent to live and work at a resort that is owned by her grandmother who Ohana has never had any relations to. That's about it in terms of the plot of the anime- we get to follow Ohana and her journey/ daily life as a waitress at a resort and the bonds she forms with her grandmother, co-workers, past flames, etc... It sounds boring as most slice of life tends to be but the drama aspect, the underbelly of romance and the occasional comedy makes each episode entertaining and reeling to watch. Art was on point. Nothing way too special to note here other than it was very standard to what animation should be in these times. The OST and music was a bit disappointing, as someone who enjoyed this anime a lot I'd expect that the OST would correlate with how great the anime was but that wasn't the case exactly. Not that the OST was bad, but it was mainly just keys and nothing that pops out and makes me go, "yea I remember that song, it's from Hanasaku Iroha!" Just wish the OST could have been stronger with tunes that stuck with me. Now the cast! Probably the highlight of the entire anime was mainly because of Ohana, her grandmother and Minko Tsurugi. I really don't want to fully analyze each character since I'm lazy, but I will go over quickly as to why I really liked each one of them. Ohana's grandmother and Minko can be lumped as one person - the grandmother is pretty shady and Minko is super salty (this makes for pretty good television). Ohana is by far the most favourited in the anime - she reminded my from Ayase from Chihayafuru, which in part is why I enjoyed Hanaksaku Iroha a lot. Ohana's extremely determined and what I like about her is that when she has a goal set to mind she will go after it with 100%. The way she handles herself against her grandmother and Minko's antics are admirable and the way she never stoops to their level to communicate is a great aspect of Ohana I just adore. Overall, Hanasaku Iroha is a fantastic anime. The premise of following a set of girls working at a resort sounds pretty boring but there's more to the anime than just that. It's a great story of hard work, determination and reaching goals which make Hanasaku Iroha so worthy of being one of the best slice of life anime I've seen so far. It's an anime that should be check off of anyone's anime plan to watch list, so watch it! So that's it for this review, the review was a bit unstructured but I really wanted to write something since I haven't wrote anything in a while and I really wanted to review this anime ASAP once I was done with it. Please comment down below your thoughts of my review or your thoughts about this anime if you've all ready seen it. Thanks for reading! Hey I really liked this anime wouldn't have watched it without your review thanks! Thanks a lot, I really appreciate your kind words!